1. Boil a pan of water with little salt. 2. Add the cauliflower pieces and keep aside for 2 to 3 minutes. 3. Combine all the other ingredients with little water to a thick batter. 4. Add the cauliflower pieces and mix well so that each piece is evenly coated with the batter. 7. Add the cauliflower pieces and fry till golden brown. 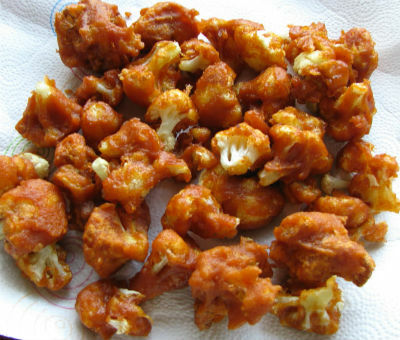 Feel free to comment or share your thoughts on this Gobi 65 (Cauliflower 65) Recipe from Awesome Cuisine.